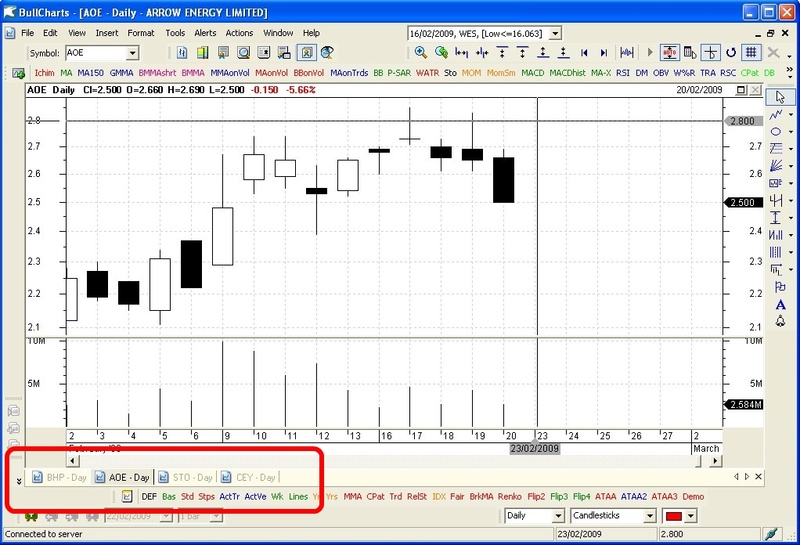 Welcome to the 9th edition of my BullCharts software Tip Sheets, focussing on tips and hints relating to the use of the Australian BullCharts charting software package. The last Tip Sheet (number 8) was delayed a few days because of a glitch with the provider I use. This took a few days to work through; but is now resolved. I started out writing these Tip Sheets on a weekly basis, but from some feedback it seems that weekly is a little too often, so I am now doing them on a fortnightly basis. I am happy to receive feedback on this, or any suggestions relating to these Tip Sheets. In this Tip Sheet edition I explain a couple of things that are both to do with how to "rearrange" the tabs across the bottom of the BullCharts window. A bit hard to explain briefly, so please see below for details. Also, the latest edition of my monthly e-Newsletter articles includes details about the very handy BullCharts IntelliCharts feature, and the ins and outs of the price charts. There is also a discussion on position sizing, and an Excel spreadsheet Position Size Calculator. If you have not seen my monthly e-Newsletter articles, you can see a preview (the first page of each of the four 4-page articles). Click here for more details about Brainy's Monthly eNewsletter articles (on Technical Analysis, Share Trading and BullCharts). BullCharts Price Charts - handling window "panes"
There are two situations in BullCharts where you might have multiple window "panes" open, and you might want to move them around. The first situation is with Stacked Indicators within just one price chart. In Brainy's Tip Sheet #3 I talked about the F3 function key to "stack" indicators within the Price Chart pane, resulting in tabs across the bottom of the screen. You might want to change the sequence of these tabs across the screen. This is explained below. The second situation is where you might have multiple price charts displayed in the BullCharts window. This might be in a "Workspace" (more on workspaces in a future Tip Sheet). You might want to re-sequence the tabs across the bottom of the window. This is also explained below. 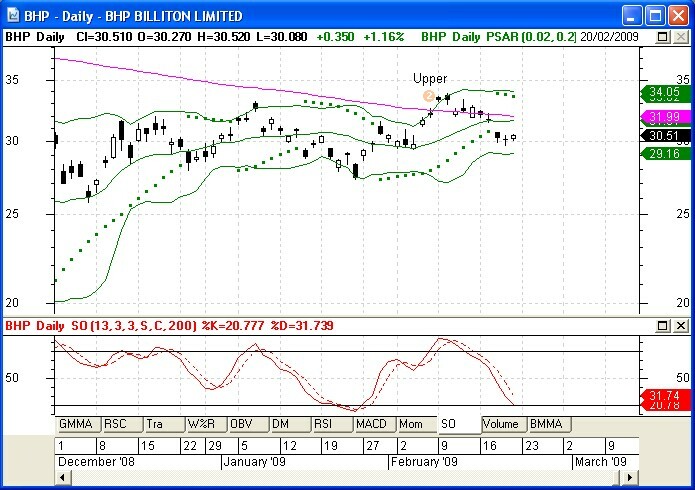 Let's say you have one price chart displayed like the one shown here of BHP. You might have several indicators showing with this chart, and by "Stacking" the indicators (using the F3 function key) you can display one of the indicators in the bottom pane (or the top pane if you have different settings), and the other indicators are hidden behind this indicator pane - that is, they are all "stacked" one behind the other. In this situation, you can click on one of the tabs to display the relevant indicator. In the sample shown here, the tabs and indicators are: GMMA (Guppy's Multiple Moving Average), RSC (Relative Strength Comparison), Tra (number of Trades), W%R (Williams %R), OBV (On Balance Volume), DM (Directional Movement and ADX), RSI (Relative Strength Index), MACD, Mom (Momentum), SO (Stochastic), Volume, and BMMA (Brainy's own Multiple Moving Average indicator). If you are not happy with the sequence of these tabs across the screen, you can right-click on one of them, and choose "Move pane..." from the drop-down menu. Another dialogue box will open showing a list of the indicator panes, and you can select any one of the listed panes, and click on the "Move Up" or "Move Down" button to change it's sequence in the list. Then click on Apply, or OK to save the changes. BTW:- What is the difference between Apply and OK? Clicking on Apply will apply the changes and leave the dialogue box open. Clicking on OK will apply the changes, and close the dialogue box. What's the use of this? Well you might want to "apply" the changes, then have a look at the end result, and maybe apply some more changes. In this scenario you might have several price charts open. This might be a Workspace, or maybe you have just opened several new price charts. The result might be like in the accompanying screen shot. This sample has four price charts, shown in a "maximised" BullCharts window. That is, one price chart takes the entire BullCharts window, and the other 3 price charts are hidden behind but you can see a tab for each (highlighted with the red coloured rectangle encircling the four tabs near the bottom of the window). In this situation, you might want to change the sequence of the four tabs across the screen. That is, you might want to put them into alphabetical order, or group them together by industry type, or perhaps put index charts at the left end and price charts at the right end. Or you might want to have daily charts at the left end, and intraday charts at the right end (if you have access to intraday / live data). To do this, you can simply mouse-click on a tab and drag it to another location across the screen (ie. click and hold the left mouse button, and "drag" it). If you choose "Arrange Tabs..." a small dialogue box opens up where you can click on a tab name, and use the "up" or "down" arrow to change the sequence, or click on the "Sort" button to sort alphabetically. Have you ever wondered about the "correlation" of various stocks to each other? or of currencies to each other? or one market to another? or two indices to each other? Or perhaps just the correlation of a share price to it's index? Exactly what is "correlation"? Basically it's the study of how well two entities either track each other over time, or not track each other. And how can you use this knowledge to advantage to reduce your trading risk? TCT Australia is a company I work with in supporting traders and investors, and they ran a 2-hour workshop in Melbourne early March (on a Wednesday evening) on the topic of Correlation. More than 60 people attended this very worthwhile workshop. If you weren't there, then unfortunately you missed out. Stay tuned for information about other useful evening workshops that TCT will be running in the near future. Or you can register to receive free Trading Videos and the TCT Newsletters, and find out first hand about future workshops. See the TCT web site link below for details. TCT Australia specialises in providing training and mentoring to traders. Their best selling product is the Live Trader Program, which includes some theoretical online video training, and 5 days of hands-on realistic and mentored trading practise in their trading room (using a practise trading account with $100,000 of play money). Feel free to contact me for further details about this program.